After deciding to make some gluten free waffles for breakfast this morning, I had the brainstorm to turn them into something like the Shortcake Biscuits with Warm Berries and Whipped Cream that I love so much. I'd made that a week or so ago and I just cleaned the fridge and washed out the container holding the berries. They still smelled so nice and fruity and wonderful, that I wanted to have them again. WAFFLES would be the perfect vehicle to enjoy the berries and cream again, and these waffles are a little bit healthier than the shortcake biscuits. Well, probably a lot healthier. Since discovering Better Batter Gluten Free All Purpose Flour, that's been my go-to gf flour, but for these waffles, Bob's Red Mill Gluten Free All Purpose Flour is better. Bob's GF AP flour has more fiber and protein and it just makes awesome waffles. So that's what I did, and oh, my. I think I've found a new Sunday breakfast favorite. Mmmmm...the warm berries soak into the waffle a little, and the cream adds its sweet creamy dimension to the mix. Very nice. Yes, very nice indeed. I'm also going to consider it a healthy way to enjoy my favorite dessert of Shortcake Biscuits with Berries. Please don't tell me it's not healthy. Let me keep my fantasy. Thanks. Place frozen berries in a heavy medium saucepan over medium-high heat. Add sugar, cornstarch, and lemon juice; stir. Cook berries until they start to boil. Reduce heat to low and simmer for about 5-6 minutes. Blackberries and raspberries will have fallen apart, but most blueberries will remain whole. Whip cream, sugar and vanilla until stiff peaks form (I put in a lot of sugar for my whipped cream because the waffles and the berries don't have much sugar. If you don't like your food super sweet, you might want to cut the powdered sugar in half). Refrigerate until ready to serve. In a medium bowl, whisk together the gf flour, xanthan gum, tablespoon of sugar, baking powder, and salt. Set aside. In a large bowl, beat eggs in large bowl with hand beater until fluffy. Beat in buttermilk, milk, butter, oil, and vanilla. Beat in dry ingredients just until smooth. 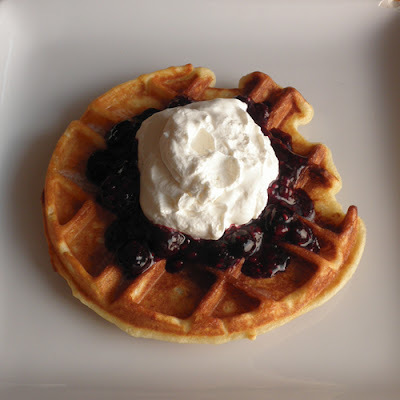 Place cooked waffle on a plate, scoop on about 1/2 cup of the berries and about 1/2 cup whipped cream. *Xanthan gum powder gives gluten-free baked products a more "bready" texture. I accidentally left out the xanthan gum one time, and the batter was markedly more drippy, and the waffles much crisper. So, if you want light, crisp waffles, leave out the xanthan gum, which is pretty pricey if you're only an occasional gluten-free baker (e.g. $11.99/8 oz. package).